These are extraordinary, forming a two mile circuit around the heart of the city, tracing out an approximately playing-card-shaped path. The Romans started them off as earthen banks, soon fronted with stone for greater defensive strength. City fathers later extended the ring to its current extent and topped it off with a capstone walkway. Large gateways allowed the populace in and out, and a variety of observation towers became embedded within. 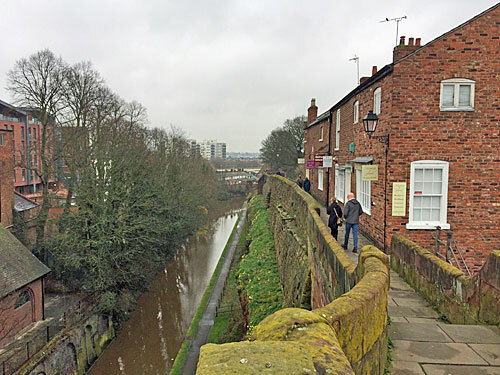 But whereas most English cities knocked most of theirs down, Chester retained its wall, and it's still possible to go for a complete circuit to this day. Except it isn't quite. A 100m gap on the southern flank facing the River Dee takes you back to street level. Not all of the wall is original - some bits are Civil War restorations, others are Georgian infill, and the odd elevated section looks very much like late 20th century concrete. All the original 'gates' are long gone, replaced by wider vehicle-friendly gaps. One northern section has been fenced off for repairs for two years after the stairs were found to be highly unstable, and trains to Wales run straight through where the northwestern corner used to be. But the remainder's impressive enough, and that's most of it, rest assured. 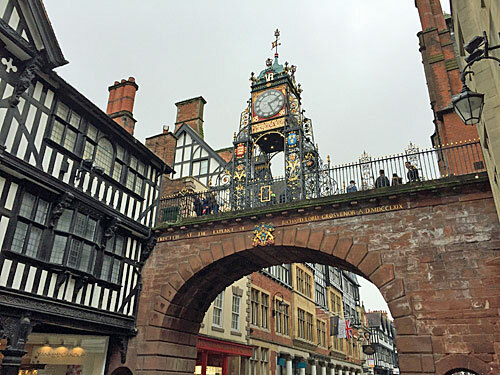 Chester's central shopping district is lined by tall half-timbered buildings, very Elizabethan-looking (even if most are Victorian rebuilds), and collectively most striking. Some are boutiques, some are chains like W H Smiths, while others are nothing more than generic mobile phone repair shops in an impressive setting. Most notable are the Rows, a two storey configuration dating back to medieval times, where the upper floor is set back behind covered walkways and the ground floor nudged slightly underground. None of this looks especially disabled-friendly, and the upper terrace I walked along felt a bit untravelled, but my word it puts your local architecturally-bereft shopping centre to shame. It's said to be the second most photographed clock in England, after Big Ben (which I know is technically not a clock, before all the pedants write in). It's perched on what used to be the eastern gate into the city, replaced by a sandstone arch in the 18th century, and now located partway along the main shopping street. The four-faced clock, glinting gold beneath a copper cupola, was added for Queen Victoria's Diamond Jubilee, It looks good from below, but for a decent close-up is best approached along the city walls, and then you can wave back down at all the shoppers snapping up. The city boasts a middle-ranking cathedral, neither wildly alluring nor drably mundane, perhaps because it's built from local sandstone. Entrance is free, although you have to queue at a desk for a ticket on the way in, and when the till flashes up "Customer" it cheapens the experience somewhat. As well as a donation, what they're hoping is that you'll pay for an 'experience' up the tower, reached via various narrow elevated passageways, although I judged sodden spring days weren't the best time for a decent view. My favourite (downstairs) element was probably the cloisters, with second place to an under-construction 350000-brick model of the cathedral in Lego, currently risen to top-of-the-windows level. Chester's museum straddles the needs of locals and tourists alike, hence feels a little underwhelming for a city of this historical calibre. The highlight is the gallery packed with Roman gravestones uncovered from the city walls during renovation, their inscriptions protected from the elements over the intervening centuries. The actual Roman gallery is perhaps a little dated, and the collection of fine silverware upstairs probably never gets busy. I liked the period rooms hidden behind the gift shop, and one of the contemporary art exhibitions, but gave the could've-been-anywhere natural history galleries a miss, sorry. The city's finest Roman remains lie just outside the walls, specifically England's largest amphitheatre, or rather what's left of it. Once a deep, fully-seated bowl, now only the lower level remains, and two-thirds of the oval has never been excavated. On the undisturbed side lies Dee House, a Georgian townhouse listed in its own right, leaving the council in a dilemma as to which feature should be more worthy of preservation. While they agonise over making their minds up, and whether a boutique hotel would be the best outcome, bring a packed lunch and imagine gladiators battling to the death. 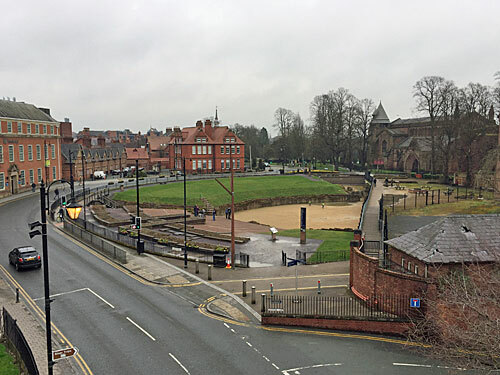 Chester has the UK's oldest racecourse in continuous use, and also one of the shortest at barely one mile in length. It's located on The Roodee, adjacent to the city walls, inside a meander on the Dee which used to be Roman harbour. Racing's infrequent, between May and September only, and gives members of Cheshire society somewhere to see and be seen. Even without going to the races I was struck by how well-groomed many of the locals were, bedecked in the best labels, shod in proper footwear and with barely a hair out of place (blondes being more frequent than genetics would suggest). Check the dress code before attending. Regularly voted best zoo in Britain, and always the country's most-visited wildlife attraction, Chester Zoo has grown from a private collection to a genuine family-friendly success. I am however unable to write a review because a) I didn't go, b) I have a conflict of interest relating to The North of England Zoological Society. This is your chance to add your comments, if any of you have been, which seems likely given it gets almost two million visitors a year. Update: Andrew says "The zoo is a good one, particularly if you have children in train. Elephants, rhinos, chimpanzees, orangutans, etc. Monorail and boat trip. Some bits were somewhat tired when I was there last but I understand the owners have been/are refreshing parts of it." Caz adds "The enclosures are spacious and the animals look contented. The new Islands area is very attractive with themed structures, sound effects and planting – and there’s a fun boat trip." The Dee loops around Chester's southern rim, and is easily accessed. 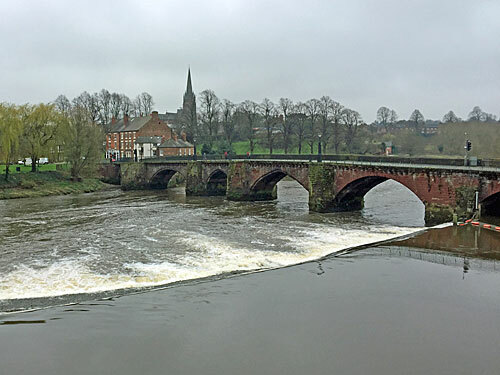 Two readers recommend a boat trip "from the Groves upriver as far as the iron bridge", and a third once tried hiring a rowing boat to oar it himself. Mike also suggests "a stroll in the Meadows on the other side of the river, where the countryside comes right into the city". If it's a sunny day, Wole rates "a stroll through Grosvenor Park" (which I see also boasts a miniature railway open at weekends from Easter). Amber has particular memories of the swans, "lots of them, flying or paddling downstream to 'work' in the city centre where they would be fed and photographed." This one's are over to you. I only spent three hours in Chester, and spent an hour of that checking out a peripheral football stadium, plus I remember scandalously little of my previous visit in 1980. If you don't come up with something I shall be forced to write about a walk along the canal and the underwhelming castle. You can do better.